I love a good girls’ night in. Especially when there is wine and good food involved. They say that laughter is the best medicine – and that holds true when the girls break out the irresistible new party game YeahNOPE (by Wonder Forge). I’m pretty confident that I know my friends well. I’ve got a beat on how they react to certain situations. I know what wine they prefer and how they take their coffee. I could predict with some degree of accuracy, whether they are string bikini or tankini types. But YeahNOPE takes “knowing your friends” to an entirely new level. Go ahead and start planning now… as you are reading this post. You only need 3-8 players, so grab your best girlfriend’s for a night of food, drinks, and hilarity. 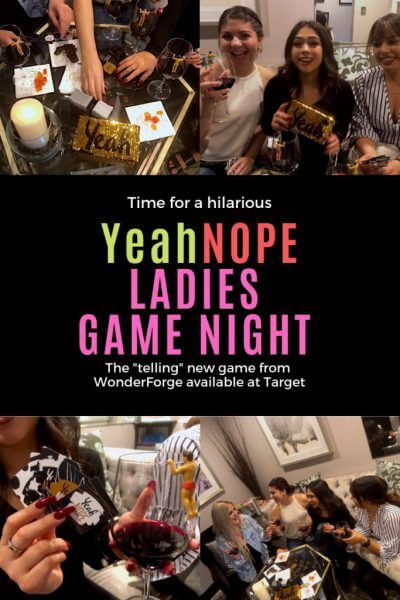 Available exclusively at Target, YeahNOPE is a tell-all game that forces players to guess what happened and how! 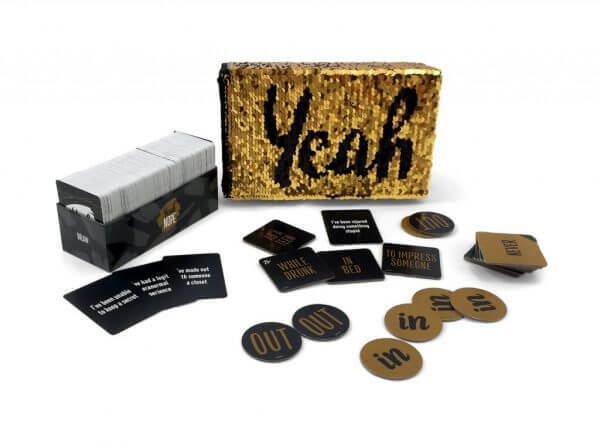 The game starts with questions like “Have you told off a boss?” or “Made out with someone in a closet?” Players then work together to build on the story and speculate using situation cards until the moment the truth is revealed with a Yeah or NOPE swipe of the oh-so-enticing gold sequined box. Great as a coffee table accessory when it’s not in play, but the fun really takes off when your girlfriends are over! 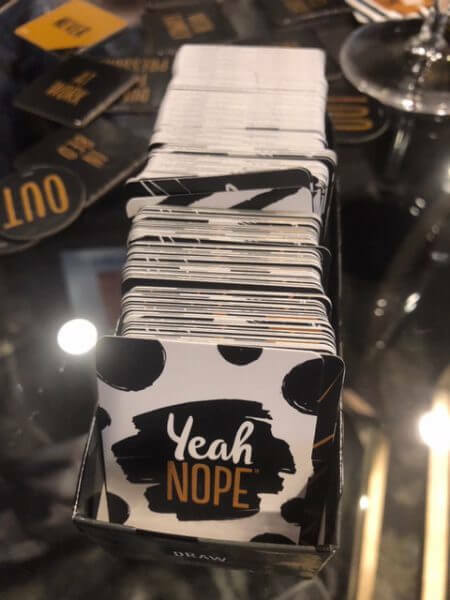 YeahNOPE is a combination of so many popular free-form informal party games like Truth or Dare and Three Questions and a Lie. But it’s a little more organized and takes a lot of the guesswork away. With just a little structure and situational suggestions, YeahNOPE is a great game that quickly reveals the juiciest stories. Laughter and hilarity are a side effect. We all know that this is a time-tested recipe for memorable get-togethers. We are big fans of “adult” style games in our house. One of the fun benefits of having older/adult kids and many neighbors that are friends is that we entertain and host a lot of game nights. Getting everyone to put down their phones and converse is so much easier when you crack open a good game. Games that make us laugh, and shock us a little, are our faves. 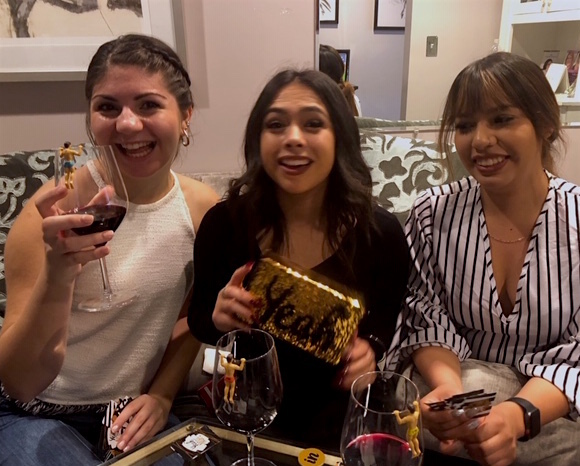 Paired with wine, cheese, and good friends, you are pretty much guaranteed a successful gathering. YeahNOPE gives everyone the chance to be the center of attention when it is their turn to be “It”. Players must collaborate and crowdsource their answers. In order to choose a situation, they must share their knowledge and impressions of the individual who is “it”. What situation would make that experience fit, based on their knowledge of the person? 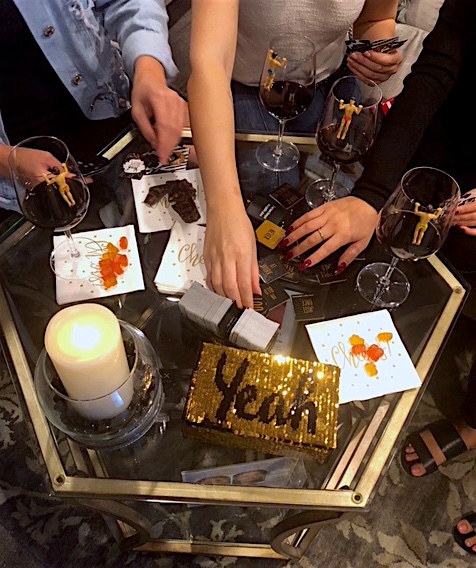 YeahNOPE is the perfect game for a lively holiday mixer and it makes a perfect hostess gift or gift for a friend. The sequined box is so fun and lovely that you can leave it out on the coffee table. It’s a conversation piece in and of itself. 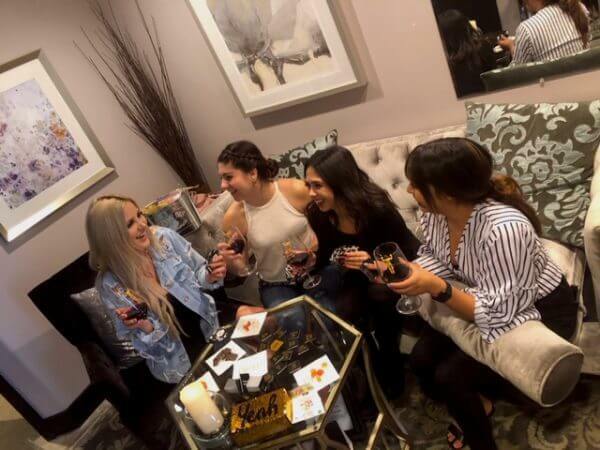 Whether you are playing the game to win or just playing using the cards to start a lively conversation, you are sure to uncover some great stories about your friends. Are you hosting a game night or family get together? I’ve got a YeahNOPE Ladies Night Party package to give away. Enter to win and get ready for your next girls night! YeahNOPE is available exclusively at Target and so are all the items listed below. We have game night at LEAST twice a month. It is usually guys and gals, but occasionally we do ladies night only! I think this is going on the menu for our next party. Thanks for sharing! This just looks like it would be so much fun – and I have 3 sisters to share the experience with! I love games where everyone gets to speak and start a conversation. Sounds like fun! I think this game would be so much fun to play with my girl friends. We often have family lady night out gatherings near the holidays usually baking then relaxing playing games. I would love to win this for a friend who always is having fun nights. She would love this! This game looks like a great reason to get together with friends and have a few laughs! I’d love to have this game and host a ladies night because it looms loke it could be real fun. To spend some time to get to know others.